I currently live in Seattle, which sits in a county where 73.9% of voters chose Clinton. My former city of San Francisco leaned even more blue at 85.3%. My Facebook news feed has been full of shock and disappointment since election night. I’ve been sitting on this draft for weeks as I tried to find the right words. I don’t personally think this means we are regressing, racist or sexist. I think those are easy answers. Scapegoats. I fully believe some portion of the population is and always has represented those viewpoints and this election, particularly, gave voice to certain elements that have been quiet on a national scale lately. Those aren’t the reason though and putting the blame on them diminishes our chances of moving forward in a productive manner. The reason this happened is that democracy is working as intended. Over the past year I’ve lost faith in many things – civility during the election process of our highest positions among them. I almost lost my faith in democracy. But when I stop to reflect, this is what is supposed to happen. This was the fail safe. The release valve. This is when happens when enough people feel neglected. Once you give someone the right to vote, it becomes very hard to ignore them. This election was a reaction to the recent past. For the past eight years we’ve had a president that aggressively pursued an agenda that nearly half of the country felt very uncomfortable with – right or wrong. For the past 25 years we’ve had a government that aggressively pursued a bipartisan agenda that neglected the best interests of a large portion of the population – right or wrong. The people affected by either of those felt unheard and they spoke with their vote. They sided with the person that seemed to be listening to them. That is what democracy asks us to do. How did this happen? It happened in 1776 (and 1870 and 1920 – though in this case, realistically, 1776). U.S. presidential elections are largely a game of showing up and as such are awarded to the group of people that is the most upset or hopeful. That is what makes the difference in a few percent of people showing up to vote. In this case, the group that was most upset* was one that holds beliefs that are being left behind by the march of progress: lower taxes, the idea that life begins at conception, the right to bear arms, temperance in accepting immigrants among others. You can not drop the frog into boiling water, you must change things slowly in a democracy. If you try to leave behind people who hold opinions you don’t agree with, there will eventually be enough of them that they will win an election. You must instead chose another path. You must change their mind, move at a pace that the population can accept or find compromises. We sometimes celebrate big decisions as though they represent moments of change. But they rarely are. They are in fact just codifications of a slowly shifting public opinion. Consider the Supreme Court decision on gay marriage from 2015. Was this really a landmark decision? Or had we finally just reached the point where the public opinion had finally flipped (plus a few years to get through government red tape). 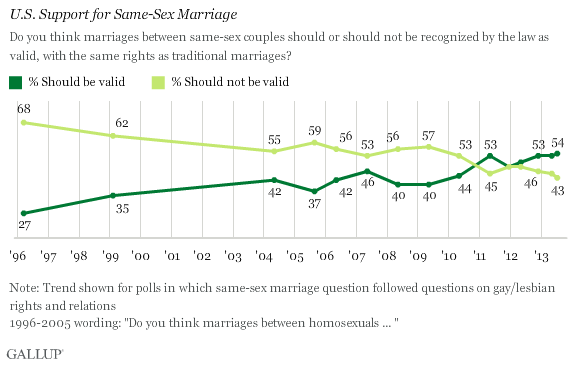 The data shows, we had already decided as a country that we were ok with gay marriage. It happened person by person as we got to know gay individuals and conquered our fears of the ‘others’. It happened due to brave individuals standing up for what they believed in and facing consequences so that others after them might live in a different world. This has happened many times before, pick a landmark Supreme Court case and look at the popular opinion leading up to it, they are not leaders, they are followers. Pick a revolution and look at the popular opinion leading up to it – it was not the start of a movement, it was the culmination. It happened because we haven’t spent enough time or energy finding common ground. We don’t live in the same places or even speak the same language. Liberal thinkers move to big cities on the coasts or within the shadow of academia while conservatives stay in small towns and red states. We associate with people we tend to agree with, engage in conversations that affirm our worldview and consume media that supports our opinions. We sacrifice long term national change for short term personal comfort. 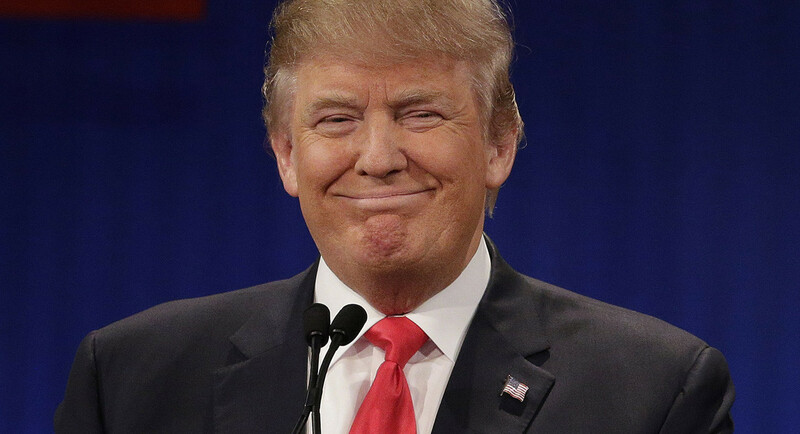 How many people do you know that voted for the other candidate? How many did you have over for dinner this year? How many did you watch the debates with and engage in your own civil debate afterwards – one that was possible because of long term trust and respect. How can we be one country if we spend our lives as two? How can we expect anything other than polar knee jerks and a pendulum of eight years? If we want change, we must engage continually. The most impactful thing we can do is spend time with those that do not agree with us and seek to understand them. We will either shift their opinions to our or gain the knowledge to better empathize with them so we can shift our policy to account for them as well. *If you believe you are/were truly upset – ask yourself what percentage of your time and income you devoted to the result you desired. Was it more or less than the percent you devoted to Netflix this year? This is generally a good litmus test for seeing how much you actually care about anything. Posted on November 23, 2016 November 24, 2016 Categories My Thinking On Various TopicsTags Politics1 Comment on How Could This Happen? 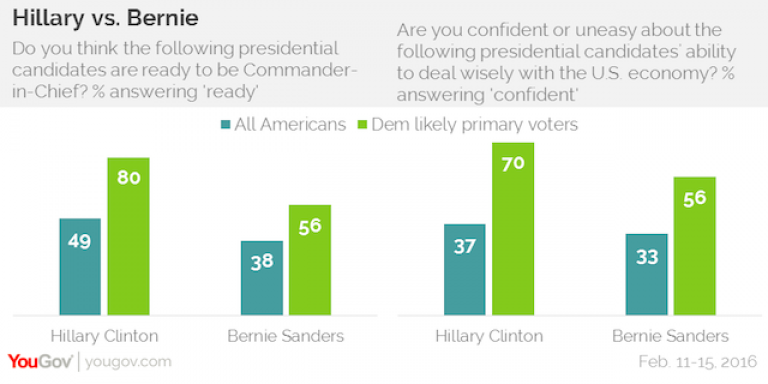 Is Clinton Support a Gender Issue? I just finished reading some great points in this Salon article about sexism and how it has changed/improved but not disappeared and how that relates to the Clinton campaign. The fact is, millennials don’t support her because they don’t trust her – that is what they keep telling everyone. She is viewed as the least trustworthy of all of the candidates – including Trump. It isn’t surprising. She is involved in (as of my last count) four federal investigations and won’t answer important questions about connections to large institutions that the same millennials also don’t trust. Male politicians and CEOs often resign for much less than what she’s being accused of. Making this a gender issue would be as unfair as making the 2012 election about gender. The reasons most people did not want Palin to be VP wasn’t because she is a woman, it is because they didn’t think she was/is competent based on her actions and words. Most people actually think she is quite competent. This isn’t the subtle sexism described in the article. The ‘oh, you run your company all by yourself’. This is cut and dry – people think she is the most qualified but the least trustworthy and the fact that they are voting for Bernie shows that trust is a higher weighted issue with them right now. Overall, this conversation about sexism and how it relates to this election seems like a simple case of bad sample size. We have one woman running for president and are using it to extrapolate our feelings and actions towards 50.4% of the population. Perhaps if a woman that was deemed trustworthy and competent was running, we would have a better indicator of the current state of gender related biases – which absolutely still exist. The fact is, the heart of her campaigns weakness isn’t gender, it is trust. Her campaign knows how to put spin or a story though and the more we let her push the issue of gender, the more we lose sight of the heart of the matter. Lets keep working on discrimination and gender bias. Lets get a woman in the oval office. Lets not sacrifice our values in hopes of jumping at the first chance to do that. Posted on March 7, 2016 March 8, 2016 Categories My Thinking On Various TopicsTags Current Events, PoliticsLeave a comment on Is Clinton Support a Gender Issue?